Bereavement at the death of loved ones repeatedly touched the life of the Prophet Joseph Smith. On June 15, 1828, in Harmony, Pennsylvania, Joseph and Emma’s first son, Alvin, died a short time after birth. When Joseph and Emma moved from New York to Kirtland, Ohio, in February 1831, Emma was again pregnant, this time with twins. Shortly after Joseph and Emma’s arrival in Kirtland, they moved to a cabin on the farm of Church member Isaac Morley. There, on April 30, little Thadeus and Louisa were born, but they did not long survive, dying within a few hours of their birth. At the same time, in the nearby town of Warrensville, Ohio, Brother John Murdock lost his wife, Julia, who had just given birth to healthy twins. With a family that now included five children, Brother Murdock felt unable to care for the new arrivals, and he asked Joseph and Emma to adopt them as their own. This Joseph and Emma did, gratefully taking the two infants, named Joseph and Julia, into their family. Tragically, little Joseph died eleven months later in March 1832, a consequence of being exposed to the cold night air while suffering with measles when the Prophet was tarred and feathered by a mob. With this death, the grieving parents had laid to rest four of their first five children, leaving Julia as their only living child. Of the eleven children of Joseph and Emma—nine born to them and two adopted—only five would live to adulthood: Julia, born in 1831; Joseph III, born in 1832; Frederick, born in 1836; Alexander, born in 1838; and David, born in November 1844, five months after his father’s death. Joseph and Emma’s 14-month-old son Don Carlos died in 1841, and a son born in 1842 died the same day he was born. During his lifetime, Joseph Smith also lost three brothers to untimely deaths. Ephraim died soon after birth in 1810. Joseph’s older brother Alvin died in 1823 at the age of 25, and his younger brother Don Carlos died in 1841, also at 25 years of age. Drawing upon these difficult experiences from his own life and his inspired understanding of the Savior’s Atonement, the Prophet Joseph Smith was able to give much-needed comfort to many mourning Saints. When beloved family members or friends die, we have great comfort in knowing we will meet them again in the world to come. Elder Lorenzo D. Barnes died while serving as a missionary in England. The Prophet spoke of his passing at a meeting held in the unfinished Nauvoo Temple: “I will tell you what I want. If tomorrow I shall be called to lie in yonder tomb, in the morning of the resurrection let me strike hands with my father, and cry, ‘My father,’ and he will say, ‘My son, my son,’ as soon as the rock rends and before we come out of our graves. “And may we contemplate these things so? Yes, if we learn how to live and how to die. When we lie down we contemplate how we may rise in the morning; and it is pleasing for friends to lie down together, locked in the arms of love, to sleep and wake in each other’s embrace and renew their conversation. “Would you think it strange if I relate what I have seen in vision in relation to this interesting theme? Those who have died in Jesus Christ may expect to enter into all that fruition of joy when they come forth, which they possessed or anticipated here. Parents who lose children in death will receive them in the resurrection just as they laid them down. What are your thoughts or feelings as you read the accounts on pages 171–73? How might these experiences have influenced the way the Prophet Joseph taught about death and resurrection? This chapter contains messages Joseph Smith shared with people who mourned the deaths of loved ones (pages 174–79). In these messages, the Prophet offered “hope and consolation” by teaching doctrines of the gospel and showing his hearers how those doctrines applied in their lives. As you think of loved ones who have died or who may soon die, what gospel truths bring you comfort? Why are these truths significant to you? Read the counsel Joseph Smith gave when speaking of Elder Barnes’s death, including his counsel about “how to live and how to die” (pages 175–76). What does this counsel mean to you? Think about how your life might change as you remember his counsel. Review the Prophet’s words to parents whose little children had died (pages 176–78). How can these doctrines provide hope to grieving parents? Study Joseph Smith’s counsel about reconciling ourselves to God’s will when loved ones die (pages 178–79). How does our decision to accept God’s will influence our emotions? our words and our actions? In what ways might our decision help others? 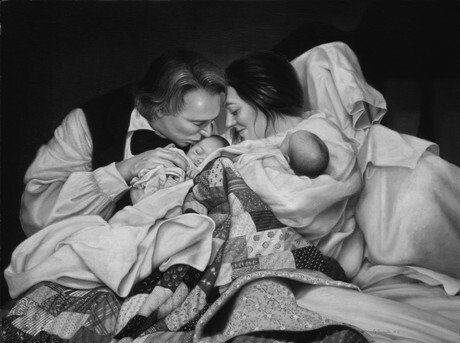 Joseph and Emma Smith with the twins they adopted shortly after their own infant twins died. Joseph and Emma gratefully took Joseph and Julia into their family, but little Joseph died in March 1832. Joseph Smith Sr., quoted in Lucy Mack Smith, “The History of Lucy Smith, Mother of the Prophet,” 1844–45 manuscript, book 18, p. 5, Church Archives, The Church of Jesus Christ of Latter-day Saints, Salt Lake City, Utah. Joseph Smith Sr., blessing given to Joseph Smith shortly before Joseph Smith Sr.’s death on Sept. 14, 1840, in Nauvoo, Illinois; quoted in Lucy Mack Smith, “The History of Lucy Smith, Mother of the Prophet,” 1845 manuscript, p. 298, Church Archives. History of the Church, 6:302–3, 310–11, 315–16; bracketed word in original; paragraph divisions altered; from a discourse given by Joseph Smith on Apr. 7, 1844, in Nauvoo, Illinois; reported by Wilford Woodruff, Willard Richards, Thomas Bullock, and William Clayton; see also appendix, page 562, item 3. History of the Church, 5:361–63; paragraph divisions altered; from a discourse given by Joseph Smith on Apr. 16, 1843, in Nauvoo, Illinois; reported by Wilford Woodruff and Willard Richards. History of the Church, 4:553–54; from a discourse given by Joseph Smith on Mar. 20, 1842, in Nauvoo, Illinois; reported by Wilford Woodruff. History of the Church, 6:316; from a discourse given by Joseph Smith on Apr. 7, 1844, in Nauvoo, Illinois; reported by Wilford Woodruff, Willard Richards, Thomas Bullock, and William Clayton; see also appendix, page 562, item 3. History of the Church, 6:366; from a discourse given by Joseph Smith on May 12, 1844, in Nauvoo, Illinois; reported by Thomas Bullock. Joseph F. Smith, “Status of Children in the Resurrection,” Improvement Era, May 1918, p. 571. Mary Isabella Horne, quoted in History of the Church, 4:556, footnote; from her statement given on Nov. 19, 1896, in Salt Lake City, Utah. History of the Church, 4:587; from a discourse given by Joseph Smith on Apr. 9, 1842, in Nauvoo, Illinois; reported by Wilford Woodruff. Letter from Joseph Smith to Emma Smith, June 6, 1832, Greenville, Indiana; Chicago Historical Society, Chicago, Illinois. Letter from Joseph Smith to Emma Smith, Jan. 20, 1840, Chester County, Pennsylvania; Chicago Historical Society, Chicago, Illinois. History of the Church, 1:341; from a letter from Joseph Smith to the brethren in Missouri, Apr. 21, 1833, Kirtland, Ohio. History of the Church, 4:432; from a letter from Joseph Smith to Smith Tuttle, Oct. 9, 1841, Nauvoo, Illinois. History of the Church, 6:51–52; from a discourse given by Joseph Smith on Oct. 9, 1843, in Nauvoo, Illinois; reported by Willard Richards and Times and Seasons, Sept. 15, 1843, p. 331; this issue of the Times and Seasons was published late.